This week we have a guest blog post from Amanda Walters (@Amanda_W84) who has a nice infographic on How to Bag the Best Job . Head of Technology at Macleod associates. Students all across the UK and the whole world are in the process of graduating. Those who have already graduated will already know how tough it is to find work of any kind. For those who do not have a career plan set out, you must set time aside to make an action plan. Finding the right job can involve moving away from home, or even emigrating. This infographic is here to help guide you through the locations with the most vacancies, top recruiters, explains what you need to know about graduate schemes, and takes you right through to the interview stage. The Bank of England has announced that it will not raise interest rates until unemployment has fallen below 7%. Last months labour market statistics show unemployment at 7.8%, to reach this target the UK will need to generate 750,000 more jobs. The Bank of England predicts that unemployment levels will reach this target by 2016. "While job growth has been a relative positive in recent years, unemployment is still high. "There are one million more people unemployed today than before the financial crisis; and many who have jobs would like to work more than they currently can. The weakness in activity has also been accompanied by exceptionally weak productivity. It is for these reasons that the MPC [monetary policy committee] judges there to be a significant margin of slack in the economy, even though the extent of that slack, particularly the scope for a productivity rebound, is very uncertain." "The fact is real wages are set to continue falling throughout 2013 - the longest pay squeeze in over a century ­- and the Bank does not expect unemployment to fall significantly for another three years. "People will ultimately judge the recovery on the availability of good jobs and whether their disposable income is rising again, rather than economic forecasts and partisan spin." The latest issue of our Skills & Employability Review is out now. In this issue: SFA funding for work placements, the education & training foundation launches & new infographics. “We want every learner and every trainee to get maximum benefit from their experience and we want every practitioner to benefit from effective and impactful continuing professional development opportunities,” commented Sir Geoff Hall, Foundation Interim Chief Executive. The Foundation's board members come from leading organisations in the further education sector including the AoC and AELP. Representatives from training providers Enable, HIT and General Physics Skills Training Academy and further education colleges Nottinghamshire College, Kirklees College and Stockton Riverside College have joined the board bringing their knowledge and experience of engaging with learners and the workforce. The Skills Funding Agency (SFA) has announced funding rates from £500 to £900 for work placements within the Governments new traineeship programme. “Young people in Britain deserve the chance to work and get on in life which is why we're introducing traineeships to help them get on the first rung of the ladder,” said Skills Minister Matthew Hancock. Colleges, training providers and subcontractors are eligible to claim funding for learners complying with existing funding eligibility rules where providers can show that there is reasonable chance of the young person being ready for employment, or an Apprenticeship within 6 months of starting their traineeships. 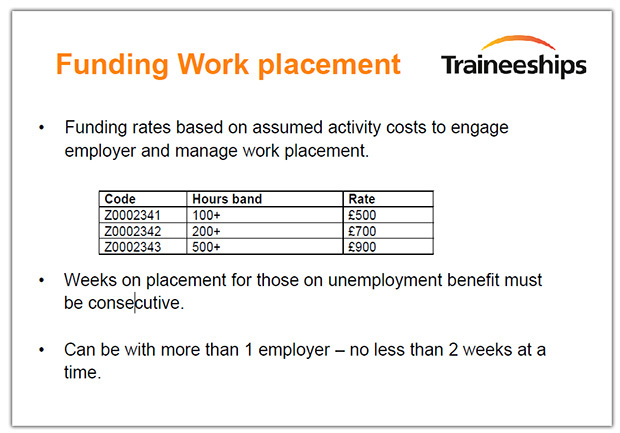 Progression to a job or an apprenticeship will also result in a 20% achievement payment trigger. To claim this funding colleges and training providers need to monitor the learner journey to prove they have met learning aims by recording a learning delivery monitoring code against all learning aims. Providers will need to evidence interventions including records of exit interviews and formal feedback as well as recording progression routes and outcomes. To find out how technology can be used to record the learner journey, track outcomes and for contract reporting contact Macleod Associates today or read about our Workpepper learner management software here.